Yates illustrates the pacing problem by comparing a sprinter and a marathon runner. How long can you maintain an all-out sprint before you are forced to jog? The answer: not very long. If you do three sets, it is physiologically impossible to sprint all-out each set. Even if you were able to maintain 100% effort throughout three sets, the effect would be detrimental—your body would be so depleted that you would be spending more time recovering from your workouts than growing. Intensity, alas, is only one half of Yates’s Heavy-Duty whole. The other half is recuperation. And the two are true moieties: insufficient recuperation impedes intensity, and insufficient intensity impedes growth. “Rest periods between sets are as long as I feel is required,” he unabashedly admits. “Many bodybuilders think training is 50% aerobic and 50% anaerobic. That is a mistake. They don’t rest enough between sets; their body is not able to regenerate enough energy to exhaust that muscle to absolute fatigue, which is the point at which optimal muscle growth begins. Yates’s Ockham’s razor approach to training did not result in an overnight conversion. For an entire decade, he experimented at gradually shaving away inefficiencies and honing a sharper edge to his intensity. Beginning in 1983 and until 1986, he used a split routine. At first, he trained four times a week, averaging three heavy sets of eight reps per exercise, but he fell into bed at night tired and stressed, confessing, “I was obviously doing too much.” Revising his schedule to every other day also proved too ambitious, so he changed it again, settling on three days a week, so that over a 14-day period, he worked each half of his body three times. Again, he fell short of peak recovery, so he trained every other day, using three exercises of two max sets each per body part. Time and again, he experimented with various volume reductions and discovered that, with each reduction, he improved in both strength and muscularity. The intensity/volume equation was clarifying itself as a constant: The more intensely he trained, the stronger he grew, and the less volume was required. Not until 1992 did Yates feel that his process had reached the sweet spot of simplicity, where he could apply the “one all-out set” principle in its quintessence to a consistent, seven-day regimen. Shoulders and triceps came first, on Day 1, affording him full power the next day for back. While he wasn’t overtrained from that two-day series, he needed a day’s rest, before returning for an all-out attack on chest and biceps. To call Yates’s leg session (his fourth training day) a body-part workout fails to accord it the awe it deserves. More properly, it was a life-sucking, flesh-frying torture that required him to insert a rest day both before and after. That, however, was as complicated as it got. This final iteration of his program had a body-part workout comprising only two to four exercises and one all-out set per exercise. No workout lasted more than an hour, and most were only 45 minutes. From then on, Yates was off into a future that was his alone, leaving a margin beyond also-rans that expanded like Hubble’s constant. Though in his later years he took the stage with a body that brandished battle ribbons of freshly severed muscles and sundered tendons—the price of his never say die gym attack—no one could ever hope to close the gap on Yates Yates’ armor-layered muscularity. 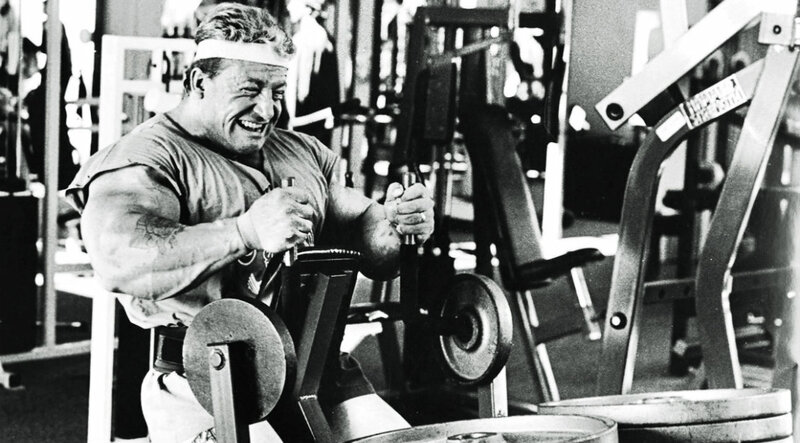 Get Dorian Yates' Age of Intensity Workout.